I'd like to have a user-specific monitor configuration profile that loads when that user logs in. I have noticed that each user can create and name their own profile, but that when a user logs in the profile that appears is the last one that was used by the previous user. 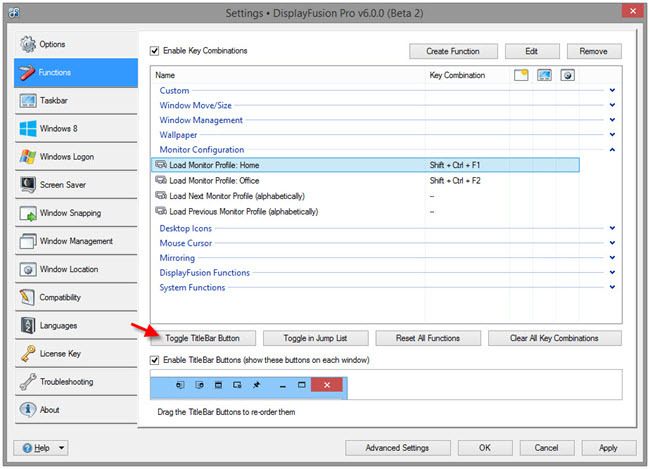 @Patrick: While the Profiles are per-user, DisplayFusion isn't actually loading the previous user's profile. 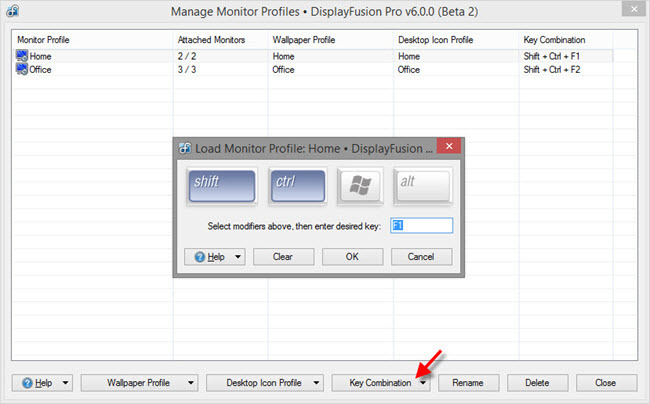 Windows itself remembers the last monitor configuration, and DisplayFusion just shows in the Monitor Configuration that the current configuration matches a specific Monitor Profile. 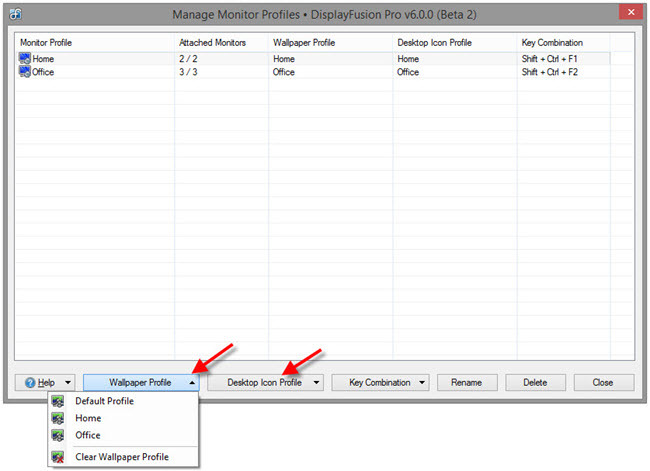 If you want to load specific Monitor Profiles on user login, you could create a batch file or login script to load the profile using DisplayFusionCommand.exe -monitorloadprofile "profile name"
Where does DisplayFusion store the Monitor Configuration and Monitor Profile files? I haven't found them in the installation directory nor in the user's AppData directory. Just want to back them up, just in case. Is it possible to use profiles to switch between a GTX and a quadro? That would be a hardware issue, not a DisplayFusion issue. You'd have to see if the nVidia drivers support switching between primary cards, I suspect that this isn't supported. Windows 10, Anniversary update. I have a Disable monitor profile for playing games (No point having 2 monitors active while playing, distracting). I find when I disable the second monitor via profile, and then re-enable it. It becomes the primary and everything moves over to it. It is correctable, but rather annoying. Let me know what info would be helpful, and if you want a discrete issue post. @Paul: Could you send us your troubleshooting info? You can do this via Help > Support Request in the Settings window. I have found this to be, through troubleshooting, a Windows 10ism. What I discovered, and then remembered, is that my "Secondary Monitor", was really "Monitor 1" and the monitor I use as my primary was internally "Monitor 2". Windows 7 and Display Fusion worked just fine with this. However, Windows 10 seems to really want "Monitor 1" as the primary, no matter how you configure things. I have not done the due diligence of following up on the Microsoft Forums for this to see if anyone else has seen this. I've attached the short version of my configuration, but also did the support request as you suggested. Does the Monitor Profile also work with window layout? Can you save window layouts per monitor profile? @Brian: No, unfortunately not. We may add that in a future version though. Is it possible to automatically switch between monitor profiles based on location or connected WiFi? Typically, the SSID you connect to at Work will be different to the one you connect to at home. Since I use a laptop and leave it on 24/7 (occasionally let it sleep or hibernate), I won't be able to automatically load my profiles at startup or user logon. I've configured keyboard shortcuts to switch between profiles, but it's all about automation in today's world. As you can see, this wouldn't work well in the 1 | 3 | 2 configuration. Moving a Window from 3 to 1 would be a ALT + Right combination, which is confusing as you'd expect to use ALT + Left. Obviously, the easy solution here is to switch the key bindings around and I've tried that already. It works fine while I'm at home with 2 monitors, but the same problem occurs when I'm at work with 4 monitors. The more monitors you add, the messed up the monitor ordering is in native Windows display. I've tried changing the cables between the monitors to re-organize the ordering, but I cannot order them the way I want. @chaos: That might be possible using a Scripted Function, I'll see what I can find out. Regarding re-ordering the IDs, that's not possible, but the DF Move to Next/Previous functions should always go left/right, it's not based on the numbers themselves. If you open the display settings and click "Identify," do the numbers on the monitors match the numbers in the display settings? Thanks for your reply. The IDs do match against the Windows display settings. However, the screen moves right or left depending on the ID. 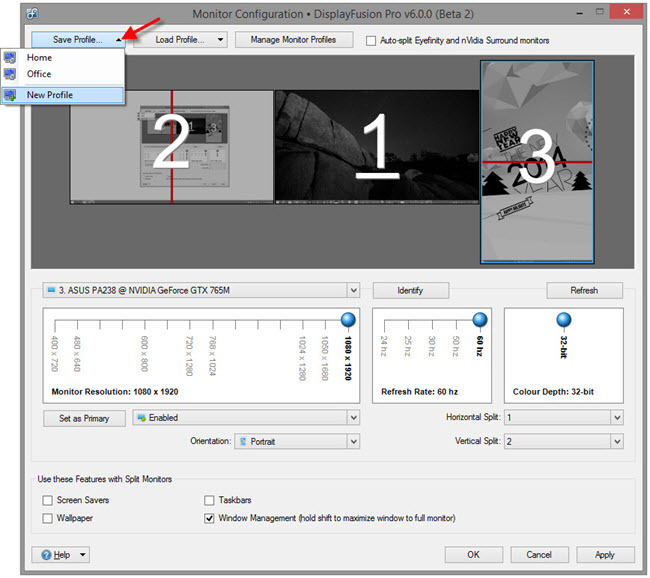 Move Window to "Next" monitor will essentially move my window from monitor 1, to 2, then 3 and 4. As you can see, this is confusing when you look at the monitors directly, as you'd expect them to move smoothly from one screen to the next. Yeah, that's very strange indeed! Can you attach a copy of your troubleshooting info? Is there a way when making a secondary profile, to disable the primary (1) monitor? Every time I try to do this, I get no error, but it always stays enabled. I've got 4 displays, 3 of which I typically use at the same time in one room, the 4th is a TV in the other room, that I like to game on sometimes. I need this display disabled most of the time, but in order for games to function properly (different resolutions and refresh rates on the various displays), I need to be able to disable all the other monitors, and enable the TV exclusively, which makes it the primary. I can make this work even with the primary display enabled, by using a hot key to switch to the second profile (which has Display 1 (monitor) and 2 (TV) enabled with the other two auxiliary displays disabled, then using Win+P and telling that to use the secondary display only, then of course, I have to repeat all these steps to get back to my primary configuration. It's very in-elegant. In fact, this is my primary reason for trying DisplayFusion. Without this software, it's even worse, since no matter how many displays you have, Win+P will only list the primary and secondary as an option, and forces me to have the TV "enabled" which extends the desktop there, and causes me to lose windows there occasionally. Anyway, if I'm missing something, please let me know, if not, assuming there's not a technical limitation, please consider adding this feature. Edit: NM, I figured it out. For anybody wondering, you can't disable the "Primary" monitor in a profile, until you make another monitor the primary, and you can't make a monitor the primary, until it's actively enabled. 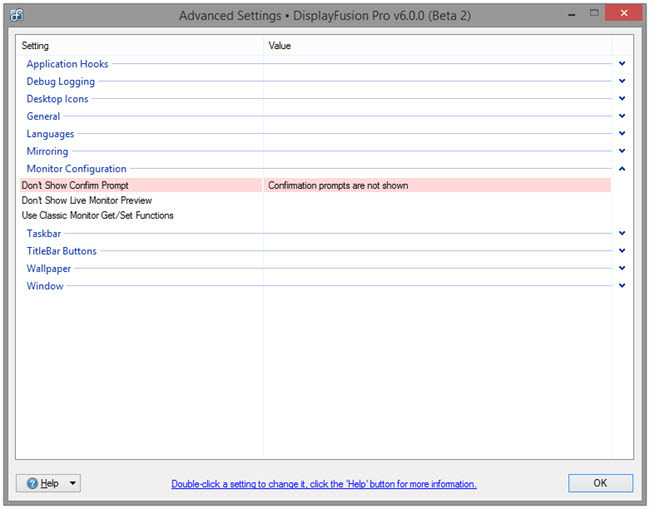 In my case I was coming from a profile that had the 4th display disabled, was re-enabling it in a new profile config, and trying to disable all the others, but until I actually "applied" the setting with that display enabled, I couldn't make it the primary, and couldn't disable the previous "primary". Not sure if this is as intended or not, but I wanted to relay my solution here in case someone else has the same issue. 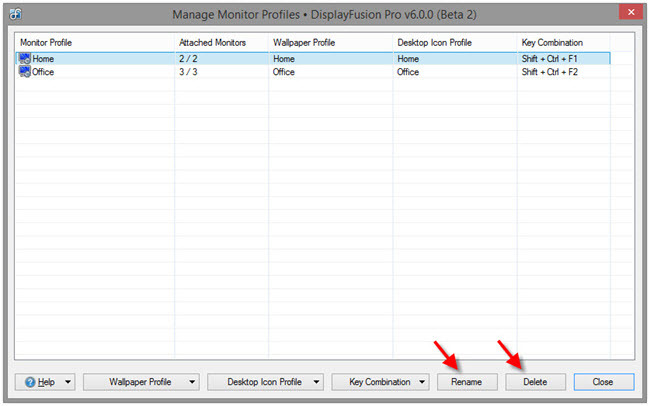 Does anyone know why DisplayFusion 9.3 keeps adding asterisk sign * to profile name upon saving? @grocal: The asterisk indicates a profile that was saved using an older version of DisplayFusion. If you're running 9.3 and you save or overwrite a profile, the asterisk should get removed. Hi Guys, is there a profile picker function button that has a drop down list (versus next in alpha list)? If I have a lot of profiles, I might have to cycle through too many different configurations where some monitors might be upsidedown (when switched from landscape to portrait). Thanks! Double-click the script named "Select Monitor Profile from Drop-Down List"